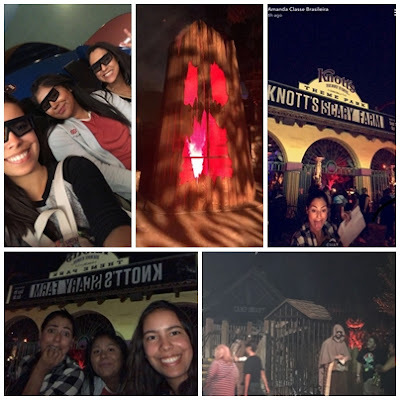 Last night several students from our Orange County campus visited Knott's Scary Farm for a real Halloween experience in America. For all of them, it was their very first time. A couple of them scared easily, so all the zombies and ghosts and other scary figures really tried to scar them to death. There were many haunted houses and scary rides. Walking around the amusement park and hiding behind every corner was someone in a really scary costume. They work there and it is their job to scare you as much as possible. Some of the people had makeup on that looked like it was done by a professional Hollywood makeup artist. Some of the students had such a good time that they are planning to go again next week!